Pottery from the Korean Neolithic at the National Museum of Korea. By definition, the Prehistory of Korea lacks written records. Records that exist include paintings, rock carvings, grave markers, and stones positioned for religious ceremonies. Prehistory of Korea covers the longest period of history on the Korean Peninsula from as early as 40,000 B.C.E. until 300 B.C.E. Archaeology, geology, and palaeontology serve as the avenues for learning about Korean prehistory. 2.1 Palaeolithic Age: 40,000 B.C.E. to 4000 B.C.E. 2.2 Neolithic people on the Korean Peninsula: 4000 B.C.E. to 300 B.C.E. See History of Korea, History of North Korea, and History of South Korea for accounts of the Korean history from the Three Kingdoms period. 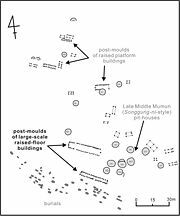 Settlement sites of the Mumun Period. Geological prehistory provides clues into Korea's most distant past. The oldest rocks in Korea date to the Precambrian era. The Yeoncheon System, formed during the Precambrian era, appear around Seoul, extending to Yeoncheon-gun in a northeasterly direction. Divided into upper and lower parts, biotite-quartz-feldspar-schist, marble, lime-silicate, quartzite, graphite schist, mica-quartz-feldspar schist, mica schist, quartzite, augen gneiss, and garnet bearing granitic gneiss compose the Yeoncheon System. The Korean Peninsula had an active geological history through the Mesozoic, when numerous mountain ranges formed, slowly becoming more stable in the Cenozoic. Major Mesozoic formations include the Gyeongsang Supergroup, a series of geological episodes in which biotite granites, shales, sandstones, conglomerates andesite, basalt, rhyolite, and tuff, laid down over most of present-day Gyeongsang-do Province. Palaeolithic Age: 40,000 B.C.E. to 4000 B.C.E. Jeulmun comb-pattern ca. 4000 B.C.E. Anthropologists debate the beginning of the Palaeolithic era, some believing Hominid occupation in Korea may date as early as c. 500,000 B.C.E. Yi and Clark express skepticism of dating the earliest occupation to the Lower Palaeolithic (Yi and Clark 1986). The Palaeolithic ends when pottery production begins, c. 8000 B.C.E. The earliest radiocarbon dates for this period indicate the antiquity of occupation on the Korean peninsula occurred between 40,000 and 30,000 B.P. (Bae 2002). If Hominid antiquity extends as far as 500,000 B.C.E., that implies Homo erectus could have been present in the Korean peninsula. No evidence has been found to link the Paleolithic inhabitants of the Korean peninsula with present day Koreans (Lee). The Palaeolithic humans lived in caves and built nomadic shelters above ground. Evidence of hearths used for cooking and warmth has been found. Palaelolithic people on the Korean Peninsula practiced hunting and gathering. They fashioned arrow heads, and a variety of tools, by chipping rock. Archaeologists suspect, but can not prove, people hunted in communities during this period. The earliest known Korean pottery dates back to c. 8000 B.C.E. or before. 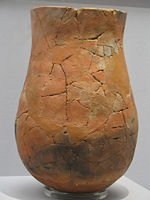 Known as Yungimun Pottery (ko:융기문토기), the pottery has been found in much of the peninsula. 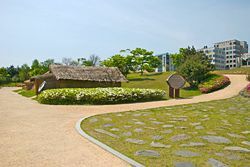 Gosan-ri in Jeju-do, and Ubong-ri in Greater Ulsan, represent examples of Yungimun-era sites. 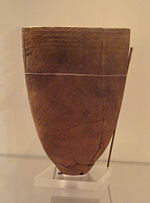 Jeulmun, or Comb-pattern Pottery (즐문토기), can be found after 7000 B.C.E. Neolithic people on the Korean Peninsula: 4000 B.C.E. to 300 B.C.E. The Dunsan prehistoric settlement site in Daejeon, South Korea. Polished stone tools and pottery identify the Neolithic people on the Korean peninsula, probably the same people who inhabited Siberia. Since few archaeological sites in this period have been found, little is known of the early Neolithic communities. Around 3000 B.C.E., abundant evidence of Neolithic people in Korea abounds. Comb pattern pottery, pottery with geometric design, characterizes this period. Around 1800 B.C.E. pottery with painted designs have been found, with origins in Manchuria. Anthropologists and Archaeologists believe that three waves of Paleolithic and Neolithic people came into the Korean peninsula. They surmise that Korean people today have an unbroken ethnic line with the Neolithic inhabitants. Neolithic Koreans lived along seashores, river banks, and inland. They ate seafood, fishing proving a regular way hunting as well as arrows for hunting mammals. They began agriculture, although evidence of gathered nuts and berries also exists. Neolithic Koreans lived in pit dwellings with a hearth typically inside. They wore animal skins, later weaving clothing from fibers and decorating them with sea shells and stones. Society began in the Neolithic period with some form of communal life, constructing huts in clusters. Clans bound by blood line, totemistic, formed clearly defined communities governed by councils with chieftains has leaders. Evidence of shamanistic religious ceremonies and burying dead in a communal plot have been unearthed. Clans existed as independent, self-sustaining communities, maintaining a closed posture. As the later Neolithic period advanced, clans linked through intermarriage. Neolithic Koreans practiced nature worship, believing that creatures and natural objects like stones have immortal souls. Rudimentary beliefs in good and evil appeared, requiring gifted people to intervene against evil spirits. Dagger and two human figures Megalithic Burial No. 5, Orim-dong, Yeosu, Korea. The introduction of Bronze caused a quantum leap in Neolithic Koreans development around 800 to 700 B.C.E. lasting to around 300 B.C.E. The Bronze Age Korean ushered a new age of development to the peninsula. Agriculture developed through the use of bronze farming tools including the cultivation of rice as well as warfare through bronze arrow heads. They created dolmen sites with megalithic stones. Societies with sophisticated political systems appeared in what is called Old Joseon that included walled-towns in Pyongyang. A king (wang) emerged as the head of confederations. That marked the beginning of the Three Kingdoms Period in Korea. Agricultural societies and the earliest forms of social-political complexity emerged in the Mumun Pottery Period (c. 1500–300 B.C.E.). People in southern Korea adopted intensive dry-field and paddy-field agriculture with a multitude of crops in the Early Mumun Period (1500–850 B.C.E.). The first societies led by big-men or chiefs emerged in the Middle Mumun (850–550 B.C.E. ), and the first ostentatious elite burials can be traced to the Late Mumun (c. 550–300 B.C.E.). Bronze production began in the Middle Mumun and became increasingly important in Mumun ceremonial and political society after 700 B.C.E. The Mumun is the first time that villages rose, became large, and then fell: Some important examples include Songgung-ni, Daepyeong, and Igeum-dong. The increasing presence of long-distance exchange, an increase in local conflicts, and the introduction of bronze and iron metallurgy are trends denoting the end of the Mumun around 300 B.C.E. The period that begins after 300 B.C.E. can be described as a "protohistoric" period, a time when some documentary sources seem to describe socieites in the Korean peninsula. The historical polities described in ancient texts such as the Samguk Sagi are an example. The Korean Protohistoric lasts until 300/400 C.E. when the early historic Korean Three Kingdoms formed as archaeologically recognizable state societies. Ancient texts such as the Samguk Sagi, Samguk Yusa, Book of Later Han or Hou Han Shou, and others have sometimes been used to interpret segments of Korean prehistory. The most well-known version of the founding story that relates the origins of the Korean ethnicity explains that Dangun came to the earth in 2333 B.C.E. Historians haved focused a significant historical inquiry in the twentieth century to the interpretation of the accounts of Gojoseon (2333–108 B.C.E. ), Gija Joseon (323–194 B.C.E. ), Wiman Joseon (194–108 B.C.E.) and others mentioned in historical texts. Intense archaeological activity has taken place in South Korea since the mid-1950s. In the 1990s North Korean media reports claimed that archaeologists discovered and partially excavated Dangun's tomb. Archaeologists and mainstream historians outside of North Korea voice skepticism about the dating methods, since the North Korean government has refused independent access and testing. Additionally, North Korean claims about the partial excavation of a large-scale burial dating before 2000 B.C.E. have been greeted with ever greater skepticism since contemporary archaeological sites consist of small isolated settlements and subsistence-related sites such as shellmiddens. Historians in Korea use the Three-age system to classify Korean prehistory. Europeans created that system to classify the European prehistoric sequence, not Korean. Korean archaeologists applied the three age system the post-Japanese colonization period (1945-) as a way to counter the erroneous claims of Japanese colonial archaeologists who insisted that, unlike Japan, Korea had no "Bronze Age" (Kim 1996). The three age system stuck until the 1990s despite failing to fit unique intricacies of prehistoric Korea. For example, until recently the periodization scheme used by Korean archaeologists proposed that the Neolithic began in 8000 B.C.E. and lasted until 1500 B.C.E. even though palaeoethnobotanical studies clearly indicate that the first bona fide cultivation began circa 3500 B.C.E. Furthermore, archaeologists claimed that the Bronze Age began in 1500 or 1000 B.C.E. and lasted until 300 B.C.E. That periodization has been repudiated by the discovery that Koreans adopted bronze technology in the southern Korean Peninsula circa 700 B.C.E. The archaeological record supports the wide spread use of bronze technology after 400 B.C.E. (Kim 1996) (Lee 2001). Despite the obviously poor fit with Korean prehistory, some expert historians in early Korean history (c. 300 B.C.E.-668 C.E.) continue to use the unsuitable Neolithic-Bronze-Iron monikers. On the other hand, most prehistoric archaeologists recognize the problems with the three-age system and have adopted a periodization scheme based on changes in pottery design and technology, i.e. the Jeulmun (c. 8000-1500 B.C.E.) and Mumun Pottery Periods (1500-300 B.C.E.). Im, Hyo-jae. 1997. Importance of Osan-ni Neolithic Culture in East Asia. Seoul: Institute of Humanities, Seoul National University. Kim, Seung-Og. 1996. 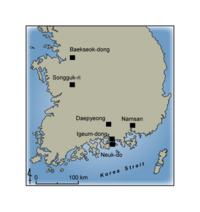 Political competition and social transformation: The development of residence, residential ward, and community in the prehistoric Taegongni of southwestern Korea. Dissertation (Ph.D.)—University of Michigan. Lee, June-Jeong. 2001. From shellfish gathering to agriculture in prehistoric Korea: the Chulmun to Mumun transition. Thesis (Ph. D.)—University of Wisconsin—Madison, 2001. This page was last modified on 28 May 2015, at 19:29.